É com imensa satisfação que comunico a 2ª publicação do IHS E- Newsletter. Nesse ano de 2016, o 48º Encontro será realizado na belíssima cidade de Ithaca (Junho 13-18) no Estado de Nova York. Estarei lá ansioso por encontrar o maior número possível de trompistas e estou certo de que será um Encontro repleto de novidades e apresentações inesquecíveis. Destaco nessa edição a entrevista com a célebre trompista internacionalmente conhecida, Gail Williams, graduada em Ithaca, o artigo pedagógico de Peter Luff e uma reportagem com Dan Vidican ( Lukas Horns). 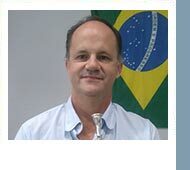 Espero que você não perca a sua inscrição para Ithaca e venha curtir o maior Encontro de Trompistas do ano de 2016 !!! 2 & 3. Performances and Lectures from Supporting Artists promise to be superb this year, too. At this writing, the committee is still working to coordinate and schedule events presented by a wide range of players, professors, historians and enthusiasts. It looks like there’ll be somewhere between 50-75 presentations from this category. Want to see your studio or ensemble’s photo in our newsletter? Send it to manager@hornsociety.org and let us know who, where, and when! 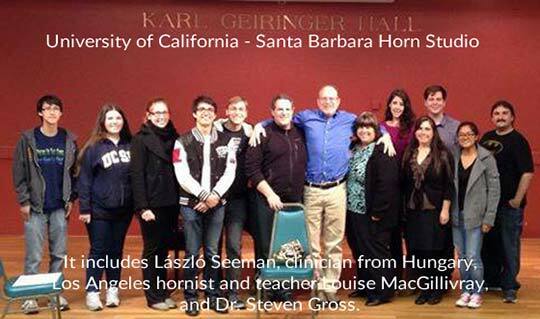 Kristina Mascher-Turner: How did you come to choose the horn in the first place? 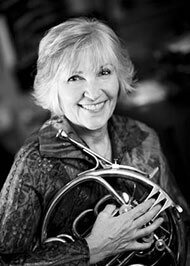 Gail Williams: My mom suggested I try the horn since I was left-handed. She had a rule that we (my two brothers and I) all play different instruments…so I got the horn. KMT: Can you tell us about your teacher at Ithaca College, Jack Covert? What was it like studying with him? GW: Mr. Covert was the most important person in my musical upbringing. He taught me the technique of the horn and the history of our instrument, exposed me to great horn players and great repertoire. But most importantly, he structured my horn playing by building a strong base. I had never had a horn lesson till my first lesson with Mr. Covert! KMT: Ithaca, New York, is situated in a place of natural beauty, and you have a love of the great outdoors. Did this love begin while studying at Ithaca College, or had it always been a part of you? GW: I have always loved the outdoors. Growing up on a beautiful Holstein farm in western New York State, Ithaca was a BIG city for me! KMT: Do you have some special memories of your student days at IC that you can share with our readers? GW: Ithaca is where I really fell in love with music. I had never really heard an orchestra or chamber music before then. On the first recital Mr. Covert gave during my freshman year, the program was the three B’s: Berkeley, Banks, and Brahms! I do also have to tell you that because I was new to “music life,” I balanced my life in Ithaca by spending time with my friends from my Holstein upbringing at the Cornell campus and their football games! KMT: While you were a student at IC, you already started successfully taking auditions. How did you prepare? GW: I didn’t really study any excerpts while I was at IC. I had to learn music and horn first! Too many students never learn the correct technique before beginning to play excerpts. I am so grateful to Mr. Covert that I played many etudes to form my background, my long base, so that I could pull from that base for orchestral playing. DO NOT MISS OUR BIGGEST EVENT OF THE YEAR! Register now (Early Bird Special Rate) and check the website often as more information gets added. This is going to be an exciting and packed event. THERE WILL BE NO ON-SITE REGISTRATION. ADVANCE REGISTRATION CLOSES MAY 9. 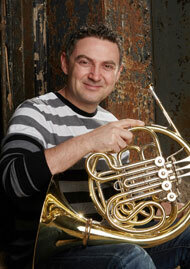 This month, our featured craftsman for “Meet Your Makers”, is Dan Vidican, the maker of Lukas Horns. His handiwork can recently be heard on the soundtrack to “Star Wars VII: The Force Awakens”, played by principal horn, Andrew Bain. Enjoy a look into the development and workings of an artisan horn builder! I'm honored and very happy to have the opportunity to share my story here. I grew up in Romania, more precisely in Cluj, one of the biggest cities in Transylvania. My aunt, who was a music teacher and played violin at the time, had a huge influence in my life. There is a certain musical tradition in my family and that certainly contributed to the decision to start playing an instrument. I started violin in the first grade when I was 6 years old, but that didn't go very well, so by the time I was 11 years old I wanted to switch to, of course, the trumpet, and somehow I got stuck with horn! After graduating from high school, and while attending the Gh. Dima Academy of Music, I won my first professional job with the Transylvania State Philharmonic, where I worked for 6 years. I’ve always had a certain affinity for the Chicago sound, even back in Romania. I remember we had a small listening booth in high school and unfortunately the horn LP selection was fairly limited to maybe 3 recordings or so, Dennis Brain Mozart s concertos, Hermann Baumann, and Schumann's “Konzertstuck” with Dale Clevenger and the famous Chicago Symphony Orchestra. I remember listening to that LP for hours at the time over a period of 6-8 months, and hoping that one day I would get to sit in a hall and hear the orchestra play live. Little did I know that fate would put me directly in the heart of that amazing town in just a few short years. 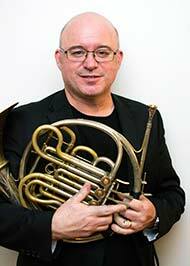 Upon arrival, in 1998, I was lucky enough to study with Jon Boen, Principal Horn of Lyric Opera of Chicago, at DePaul University, and then win an audition and become a member of Civic Orchestra of Chicago and play on the very same stage where Chicago Symphony plays. A dream come true! During my years in Chicago I was lucky enough to get work as a freelancer, and worked with a plethora of orchestras, including the Illinois Symphony Orchestra, Green Bay Symphony and substituting with orchestras like the Nashville Symphony and Grant Park Symphony among others. In 2006 I started performing as Assistant Horn with Memphis Symphony where I am currently residing and playing 4th horn. When asked to give a short lesson on a topic that I think is very important, I immediately thought of embouchure stability. Having a stable, efficient embouchure is probably the most important contributing factor to a happy, consistent playing life. I tell my students … “you are only as good as your worst day” … by this, I mean that what we consider to be our worst playing day, must be acceptable to our colleagues and the audience. Therefore, consistency is of paramount importance. I am a big fan of buzzing, both with and without the mouthpiece, and ensure my students do this as part of their practice routine. By tilting the mouthpiece down (pivoting whilst maintaining contact with the lower lip) and then away from the embouchure during the buzz (to a free buzz), a player can immediately feel which muscle groups are being employed to form the embouchure (usually by their activation in the absence of the mouthpiece). The muscles surrounding the mouthpiece (Orbicularis Oris) form the basis of your embouchure, and when formed correctly (firm corners, flat chin, alla Philip Farkas) will hold a good setup in place. These supporting muscles are naturally very strong, and when employed correctly will help to provide a solid platform to aid stamina. The key here is to develop an efficient default position for the lips so that less mouthpiece pressure is required for the production of the note, particularly in the high register. We are all physiologically different and as such need to find a setup that works with our unique lip size and teeth/jaw position, but there are basic rules that must be adhered to. Firstly, your lips must act as a double reed would, working in synergy and vibrating against one another, not a single reed where the bottom lip folds over the bottom teeth leaving the top lip to do all of the work. Apart from the obvious visual indicators, a good setup will give you a bright, loud buzz on the mouthpiece, whereas a poor setup will produce a veiled, airy sound. Learning to free buzz, by employing the “mouthpiece tilting method” as discussed before, is an excellent means of getting the bottom lip to do its job. In the vast majority of cases I recommend two thirds of the mouthpiece on the top lip with the remaining one third on the bottom. This serves two purposes, it allows good transition between high and low registers using the same basic setup and provides a resonant, projecting sound. This space is available for banner advertisements that will be seen by more than 2000 subscribers worldwide. For information on placing an ad in the monthly IHS E-Newsletter, contact Paul Austin, IHS Advertising Agent at advertising@hornsociety.oeg.